Couldn't Be Happier! !I could not be more thrilled with my save the dates!! We received the design proof within a day and received the magnets a few days later. I was so pleasantly surprised with the quick turnaround! I emailed and called Erin 1000 times with questions and she was more than happy to assist. The magnets are thick and sturdy, not like many others I've seen that turn out flimsy and roll up in the corners. The addressee printing looks so unbelievably professional (they provided a proof for that as well), I cannot wait for my guests to receive them! They look like we paid 3x what we actually did. I cannot recommend New & Blue enough!! PERFECT! !Super fast turntime. The magnets came out perfect. My son was so thrilled. I have bought them every year for his birthday parties and never been disappointed. I will definitely continue to use New & Blue! Excellent service and great product qualityOriginally we had ordered a proof from here and from another seller. The quality of this magnet was beautiful. We immediately ordered from New and Blue. Communicating with New and Blue was always very fast and they were so nice and helpful! Will be ordering our invitations from them. 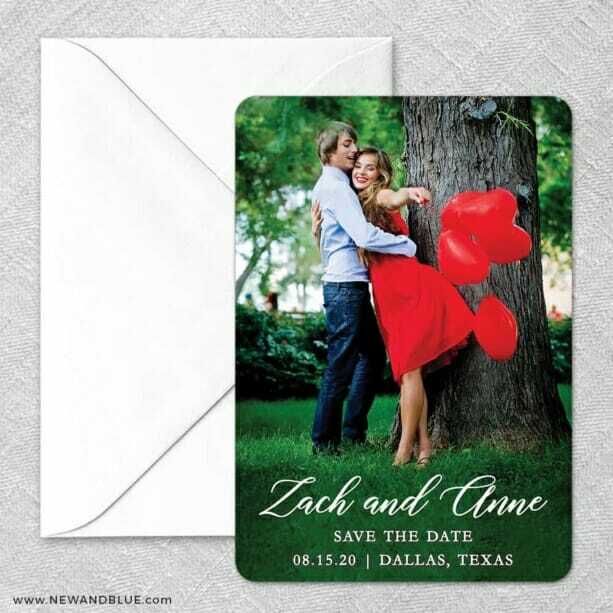 Amazing!Everyone loves our save the dates! The turnaround time was fast; we ordered Monday with a proof review and received them on Friday. Communication via email was good and they turned out better than we imagined. We would definitely order with them again!